A third Premier League win in a row was secured courtesy of an Eden Hazard brace, his 18th and 19th goals of the campaign, as Chelsea moved above Arsenal and Tottenham in the battle for a top-four finish. 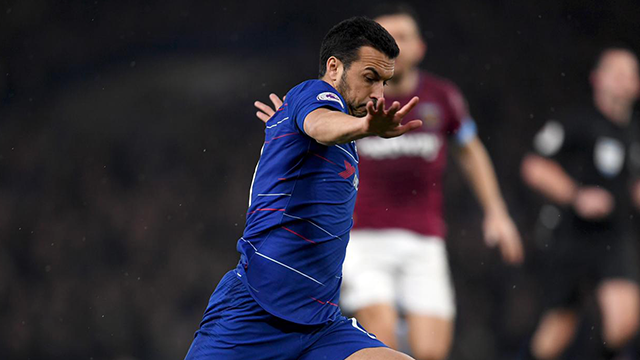 Pedro played the final stage of the game after replacing Hudson-Odoi. The Blues also secured back-to-back league clean sheets for the first time since the turn of the year and owed much to the efforts of their brilliant Belgian, whose wonder goal midway through the first period set us on the way in an entertaining London derby. It was classic Hazard, a remarkable run from the centre of the West Ham half that took four defenders out of the game, before he steadied to angle a finish into the bottom corner. There were numerous opportunities to settle the nerves, particularly before the break, but the second goal proved elusive until the final minute when Hazard fired in from the right. Chelsea now sit third with five domestic games of the season remaining, albeit having played one more than those around.